Eight talented chefs will go head to head this Thursday, April 11, at the U.S. Qualifying Event for Barilla’s eighth annual Pasta World Championship. The intense culinary showdown will take place at the Inn at Spanish Bay during the VIP Opening Night festivities of the 12th annual Pebble Beach Food & Wine Festival in Pebble Beach, Calif. Experts from Food & Wine magazine carefully selected the skilled contestants, all of whom will be whipping up innovative pasta dishes throughout the evening to wow VIP guests and a panel of discerning judges that includes Food & Wine Editor-In-Chief Hunter Lewis and Celebrity Chef Antonia Lofaso. The winner of the Qualifying Event will secure the coveted title of U.S. Master of Pasta and go on to represent the U.S. in Barilla’s eighth annual Pasta World Championship competition in Paris on Oct. 10th - 11th. Well-loved MC Billy Harris and lifestyle and entertainment expert Camille Styles will co-host the event and provide live updates and commentary as the heated and exciting battle unfolds. Barilla extends a warm thank you to AquaTerra Culinary for its partnership at the 2019 U.S. Regional Pasta World Championship. Born and raised in northern Italy, Chef Silvia Barban learned to combine the regional cuisine she grew up eating with the fresh tastes of her mother's southern Calabrian heritage. Her passion for Italian culture and pasta comes to life in her menu at LaRina Pastificio & Vino in Brooklyn. Barban was also a contestant in season 14 of Bravo's Top Chef. Chef Brandon Rosen’s passion for different cultures and cuisines comes to life in his dishes, in which he experiments with a wide range of flavors and ingredients. He is an ardent advocate of eating and cooking clean plant-forward foods and often uses pasta as the base for his creativity. Prior to his current role as a private chef in Silicon Valley, Rosen worked at Alain Ducasse at the Essex House, Eleven Madison Park, The French Laundry, benu and REDD. He was also a contestant in season 16 of Bravo’s Top Chef. Frequent travels throughout Italy led Chef Ali LaRaia to cultivate a deep love of all things Italian and inspired her to bring the tradition of strong espresso, fresh pasta and chilled wine to the U.S. via her restaurant, The Sosta, in New York City. These days, LaRaia is focused on sustainable farming and winemaking and teaching pasta-making classes in the San Francisco Bay area. While Chef Kelvin Fernandez is primarily focused on Latin cuisine, he has an appreciation for all cultures and a special place in his heart for delicious pasta dishes. Every year, he encourages his more than 56,000 Instagram followers to celebrate National Pasta Day with him. Fernandez has made a name for himself as the youngest executive chef ever on New York City’s fine dining scene and he was also a runner-up on Food Network’s Chopped and a winner on Food Network’s Beat Bobby Flay. In addition, Fernandez was named one of Forbes magazine’s Top Chefs Under 30 Years Old for Food and Wine. As a private chef to celebrities and professional athletes, Chef Kayla Greer understands the importance of healthy, nutritious meals. Some of her favorite dishes to cook include shrimp tacos, curry chicken and various pasta recipes — all of which she regularly shares with her more than 23,000 Instagram followers. Chef Sean Turner learned to appreciate the importance of a meal that transports you to a place of nostalgia and enjoyment, thanks to working with a slew of talented chefs and restaurant owners in a number of different cities. As the executive chef of Louie on DeMun in St. Louis, Mo., Turner regularly brings this value to life in pasta dishes such as Roman gnocchi with pork ragu, béchamel and Pecorino and his seasonal sweet potato ravioli with brown butter, almonds, smoked ricotta Salata and chives. Chef Angelina Bastidas has spent her entire life creating in the kitchen and experimenting with various cuisines and flavors. She began cooking when she was eight and learned from her grandmother how to develop complex flavors. She enrolled at Le Cordon Bleu at age 18 and upon graduation, began working in the kitchen at Wish Restaurant in Miami. Her expertise also includes experience at several other high-profile restaurants in Miami — Area 31, The Bazaar, Palme D'or and Tongue & Cheek. In 2014, Angelina was nominated as one of Zagat's 30 Under 30 in Miami. She describes her cuisine as focusing on local and seasonal ingredients with a new modern American twist. One visit to Chef Ryan Peters’ Instagram page and his love for and appreciation of pasta is immediately apparent. As the sous chef at Fish nor Fowl in Pittsburgh, Peters takes pride in handcrafting pasta daily for decadent dishes such as linguine and clams with confit bacon, banana peppers and pan frito and agnolotti with white bean, green tomato and Parmesan brood pesto and espelette. For the past 25 years, Billy Harris has been wowing audiences throughout the U.S. and around the world. His razor-sharp timing and brilliant improvisational skills have made him one of the most sought-after MC's in the business. A cousin of Vaudeville great Georgie Jessel, Harris has been performing his entire life. Camille Styles' passion for modern, stress-free entertaining has made her a sought-after event designer, as well as an expert in lifestyle and design to readers around the globe. As the founder and creative director of camillestyles.com, she shares the creative entertaining ideas that inspire her parties and her life with hundreds of thousands of readers every month. She is also a regular lifestyle contributor to HGTV.com and the host of HGTV’s new mobile party planning app. Carolina Diaz, Chef De Cusine at Terzo Piano at the Art Institute in Chicago, won the title at the seventh edition of the 2018 Barilla Pasta World Championship held in Milan, Italy and is the first woman to win the title of Pasta World Champion. She grew up in a large Mexican family outside of Chicago and learned how to balance flavors from her father's cooking. After a few years working as a line cook, Diaz decided in 2012 to explore Italian cuisine, eventually joining the Terzo Piano team in 2016 as Chef di Cucina. Diaz believes in using local, organic and sustainable products to cook delicious Mediterranean dishes with a Midwestern twist. Chef Antonia Lofaso’s cuisine is an invitation to explore the depths of her interior world. Her food elicits a curiosity that developed from stepping outside the suburbs of Long Island, and into the culturally diverse landscape of Los Angeles. Her belief that cavatelli and carnitas can co-exist seamlessly on the same menu conveys a sensibility, which is constantly evolving. But what remains in all of her dishes is a singular vision towards the future that longingly remembers the past. Hunter Lewis is the Editor-in-Chief of Food & Wine. Prior to that he was the editor-in-chief of Cooking Light, executive editor of Southern Living, food editor of Bon Appétit and kitchen director of Saveur. Lewis cooked under Jonathan Waxman in Sonoma County, Calif., and at Barbuto in New York City. A graduate of the University of North Carolina at Chapel Hill, he was also a reporter at The Herald-Sun in Durham, N.C. You can find him in his home kitchen in Birmingham, Ala., cooking for his family, or on Instagram and Twitter. Chef Lorenzo Boni grew up with a passion for Italian food in Bologna, Italy. While studying culinary arts, he traveled extensively throughout Italy and the U.S. His time in Italy was spent immersing himself in the regional cuisines and working at many top-rated restaurants throughout the country. In 2001, Boni joined Barilla Italy full-time at its world R&D headquarters in Parma, Italy. In 2003, he was promoted to Executive Chef for Barilla America, returning once again to the U.S. In his current role, Boni is responsible for the culinary projects of Barilla Americas, as well as managing the execution of all Barilla-sponsored consumer and trade events. He is also a spokesperson for Barilla and serves as an Italian Food Culture Educator at many food conferences across the country. Chef Steve Samson was born to a Bolognese mother and American father and was exposed to the pleasures of Italian food at a young age. Whether it was the experience he gained helping his mother in the kitchen at home or annual family trips to Italy that eventually propelled him toward a career in Italian cooking, one thing is certain: once Samson left his medical school path to become a chef, he never looked back. Samson is the chef and owner of Rossoblu in Los Angeles. 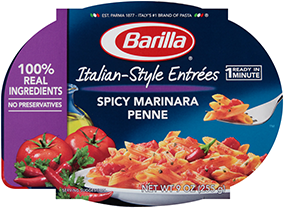 Follow @barillaus on Instagram for live action footage, news, and updates!